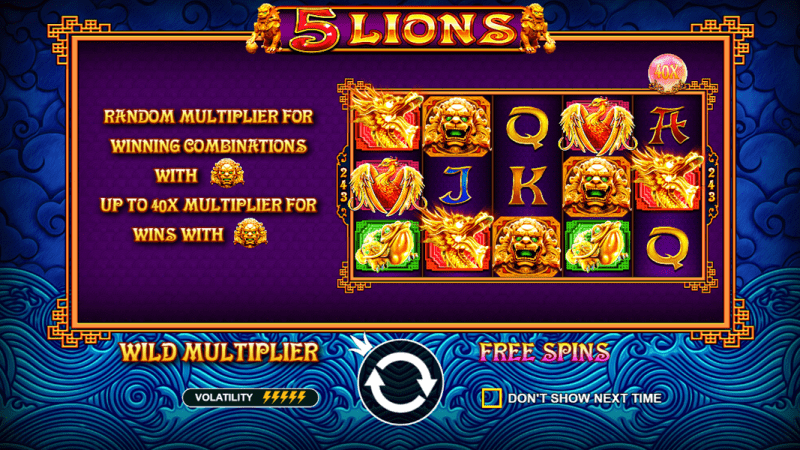 If you’re interested in the new 5 Lions slot and want to find out more about it, have a look at our detailed review. 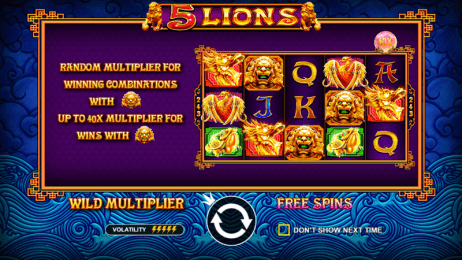 5 Lions was recently released by Pragmatic Play and is based on the Chinese fu lions, or guardian lions, which are often depicted in stone statues. 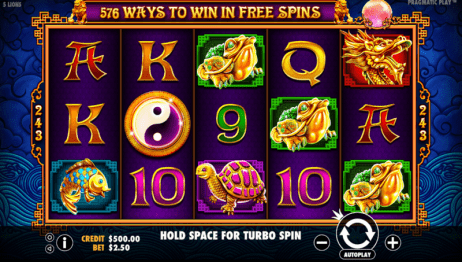 The slot’s symbols include six card values (A, K, Q, J, 10 and 9), along with various ornately decorated golden animals (a tortoise, a fish, a frog, a bird and a dragon. In addition to these standard symbols, there’s a golden lion wild symbol – this substitutes for all others except the yin yang scatter symbol. 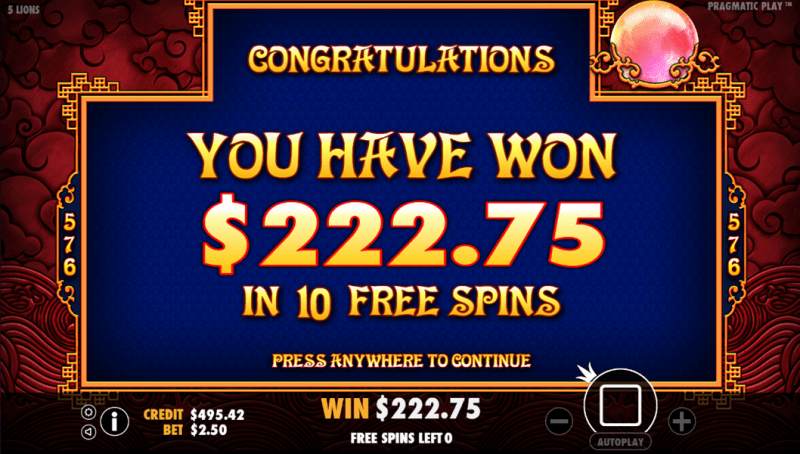 For every spin, one of the following multipliers is selected at random: 1x, 2x, 3x, 5x, 8x, 10x, 15x, 30x or 40x. 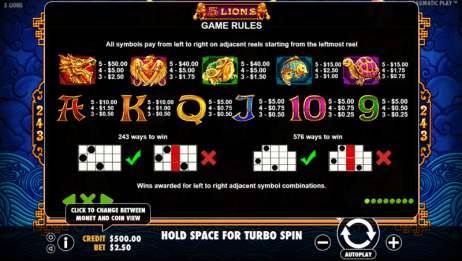 If you land a win with at least one wild, the win will be multiplied by this chosen multiplier value. 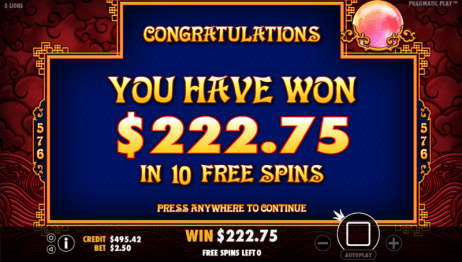 5 Lions is all about the free spins feature, which is great fun to play. Choose your option and if you land a win with a wild, your win could be multiplied by quite a lot! 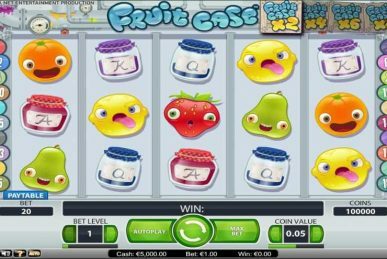 Find this slot at your favourite Pragmatic Play casino and give it a spin!